Solay Wellness Inc. CEO Isabella Samovsky said the lifestyle store is moving beyond its online-based market by franchising the business and expanding business locations. With its flagship store formally opening Thursday in downtown Evanston, lifestyle company Solay Wellness Inc. is preparing to turn its business into a franchise. The family-owned store, which sells organic products such as natural dog shampoo, is moving beyond its online-based market by franchising the business and expanding its product line, founder and CEO Isabella Samovsky said. “It’s a really nice way to work with other like-minded businesses … who are very passionate about this product,” Samovsky said. The opening of the wellness store comes as the city tries to attract more local retail businesses, as opposed to the slew of restaurants that commonly come to Evanston. The city gained four retail businesses from October to March, according to data from the city’s fourth economic quarter report. Paul Zalmezak, a member of the city’s Economic Development Committee, said earlier this month that Evanston lacks retail businesses that generate more traffic. In addition to the Evanston location at 1613 Sherman Ave., Samovksy has a store in Skokie with a salt therapy spa and yoga room. Samovsky moved into the lifestyle business when she was 20 and sold clothing made out of hemp fiber. She became a yoga instructor and experimented with salt therapy as a way of healthy living. At her Evanston store, soft classical music plays from her laptop and a meditating Buddha statue greets customers. “As I evolved my own understanding of living healthily, I incorporated it to my entrepreneurial side,” Samovksy said. The business coordinates with a group of practitioners, including acupuncturists and chiropractors, to provide wellness services on the building’s second floor. 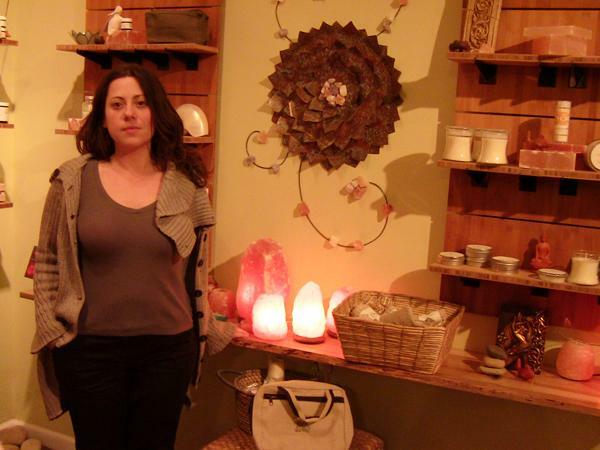 One of the shop’s signature products, the Himalayan Salt lamps are handcrafted into pyramids, globes and Hershey’s-Kiss-like domes that Samovsky said neutralize radiation. Prices listed on the company’s website for salt lamps range from $25 for a one-pound “computer companion” lamp to $140 for a 28- to 38-pound lamp. Samovsky said the store attracts customers of all ages, some with health issues ranging from sleeping disorders and skin rashes to cancer. Many of her customers in the Skokie store are established in organic product know-how, but in Evanston, the Solay products are new to most residents, Samovsky said. In addition to potentially expanding business locations, the company is redesigning its website, which will be completed in about two weeks, Samovsky said. Once the company becomes a franchise in about two months, a new owner will manage the store’s downtown Evanston location, she said. “In a little community like Evanston … it’s very personal, very one-on-one,” she said.